Okay so technically I missed January, but as the entry system over at onegameamonth.com was relaxed for the month I’m definitely still claiming it! As you may or may not know I have pledged to release one game every month of this, the year 2013. So without further ado my first game is here, and it is yet another hybrid curiosity – I’ve had a few efforts at mashing RPG mechanics into other styles of games, and this one takes most of its cues from Minesweeper of all places! 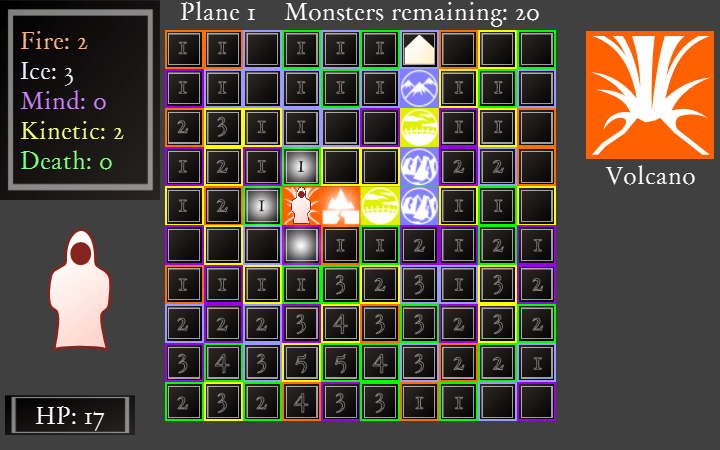 This is “Warden of the Planes” and is a sort of stripped-back dungeon-crawling RPG, but as if played on a minesweeper board. Not mines, monsters! There is some clunkiness and imbalance to it, but feedback has been quietly encouraging. I certainly haven’t ruled out further work on this to get in some much needed accessibility and prettiness. One for another month perhaps. Now I need to get onto something for February already, which could become my first look at making a graphical adventure game in Unity, something I’ve been planning to try for a while. I’d be delighted if you’d try my little game out: the title screen comes loaded with a block of text hints to hopefully help a little (e.g. start by exploring around blank tiles to not die immediately). Any feedback is welcome! This entry was posted in My Games, One Game A Month by Paul. Bookmark the permalink.